I’ve mentioned before that Luxembourg’s jewel collection is an impressive stash; it would definitely hold its own in a sparkly competition against its European counterparts. Today we talk about my favorite Luxembourg gem, and one that came terribly close to losing its place in the family collection: the Belgian Scroll Tiara. This diamond tiara of palmette, crescent, and scroll motifs was made by Henry Coosemans in 1953. In total, there are 854 diamonds here, all set in platinum, with a total weight of 46.42 carats. The center stone is an 8.1 carat diamond that can be removed and worn as a ring, and the central element can be worn as a brooch. The Sociéte Générale, Belgium's national bank, gave it to Princess Joséphine-Charlotte of Belgium as a wedding gift when she married the Hereditary Grand Duke of Luxembourg, Jean, that same year. Yes, that’s right; her bank gave her a tiara. Not too shabby, eh? Joséphine-Charlotte wore this for her wedding portrait, having already worn the Congo Diamond Necklace Tiara for the ceremony. 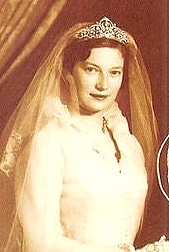 (If you can’t pull a two tiara day on your wedding day, when can you?) She continued to wear the tiara throughout her years as the Grand Duchess of Luxembourg, even after her husband had abdicated in favor of their son, Henri. 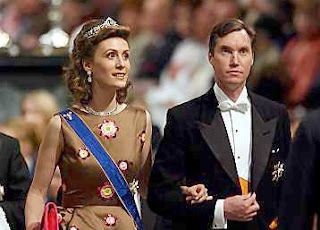 She held it close; the only instance I know of her lending it out is when daughter-in-law Princess Sibilla was allowed to wear it to the 2002 wedding of Princess Märtha Louise of Norway. Joséphine-Charlotte died in 2005, and afterwards her five children seem to have had some difficulty dividing up her assets. In 2006, an auction through Sotheby’s was announced. A large quantity of her personal jewels and other valuable possessions were to be sold by the family. Among the loot: this tiara, her other wedding tiara, and jewels from her father King Leopold and her mother, Queen Astrid of the Belgians. The jewels were private property, so it was completely within the family’s rights to do as they pleased with them. Nevertheless, the auction caused a public outcry. Rumors of tension among siblings and in-laws popped up, as well as all the old talk of the damaged relationship between Joséphine-Charlotte and her daughter-in-law Maria Teresa, the current Grand Duchess. Not only that, but the family’s finances and judgment were called into question by some. In other words: all the things that a royal house does not want questioned were suddenly a point of discussion. In light of this, the auction was cancelled. The major pieces were salvaged, including this tiara. (The family still sold off some more minor pieces; they just did it in a quieter fashion.) It now seems to belong to Henri and/or Maria Teresa, as she has been the one wearing it since the cancelled sale. As I said, this is my favorite Luxembourg tiara. The scroll motif is classical, but it has a pretty modern look to it and it seems to be easily wearable. And, you know, it's just pretty. What do you think: perfectly classic, or just not your style?